MGM Grand Harbor, Maryland - Hunger can make for great theatre and fans waiting for the main event saw two hungry Jr. middleweights give them their money’s worth for ten rounds. 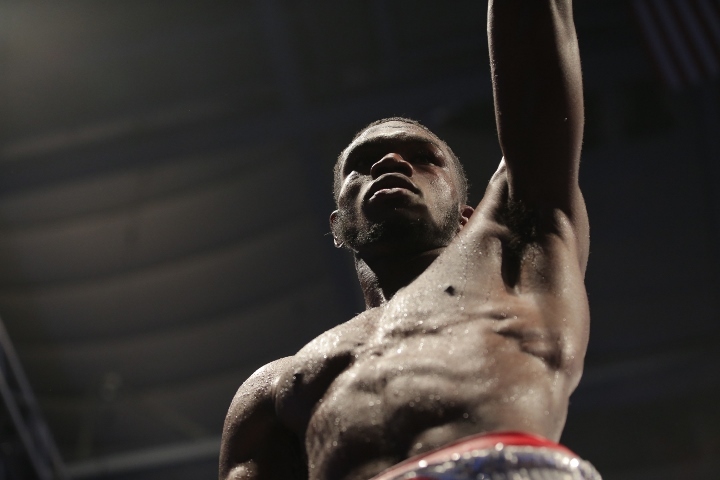 24-year old Jamontay Clark (13-1, 7 KO), 153, of Cincinnati, Ohio, survived a knockdown in round three to earn a close, well-contested ten round unanimous decision over previously undefeated 29-year old Vernon Brown (10-1-1, 7 KO) of Chicago, Illinois. The referee was Kenny Chevalier. After struggling with the length and reach of the 6’2 Clark for two rounds, Brown cut through the knot in the third with a big shot upstairs that sent Clark into the ropes. It was ruled a knockdown on the grounds that only the ropes kept him up and Clark looked in trouble. He was in trouble again in the fourth after daring to sit down on the inside with the 5’7 Brown but it was Clark who ultimately gained confidence. For the next few rounds, Brown had variable success getting back close to Clark and, when he did, the longer counter puncher had answers and was taking shots better. They both let it all hang out in the ninth round. Brown looked for one more big moment, one more knockdown, to make his case to the judges or perhaps even eliminate the need for them. Clark met him in the trenches, banging away with violent purpose and refusing to yield. The final round wasn’t quite as sustained but the final minute saw Brown trap Clark in the corner after a hellacious right to the body only for Clark to escape and land a pair of nice shots as Brown chased him across the strands into another corner. Both brave young battlers raised their hands at the bell but in the end all three judges agreed with Clark at scores of 96-93 twice and 95-94. Official punch stats favored Clark across the sum of the fight but the crowd loudly favored Brown. Brown agreed with the masses and liked the idea of a rematch. “I still think I won the fight. I caught him with the better shots. He was just slapping me with the hook and trying to catch up that way. If they want to do it again, let's do it again. Let's make it a 12 rounder. I don't think he can survive 12 rounds with me." Clark was open to whatever the future holds, confident he’d earned the decision. “I've been down before and I've seen the worst of the worst. This was nothing. I just kept grinding. I got the win and now I'm going to sit down and see what's next for me." Clark sure has heart and will! He will fight through just about anything thrown at him and never gives up.